Delage Automobile. Dieppe Circuit, A.C.F. Grand Prix, Le Tréport, June 26, 1912. 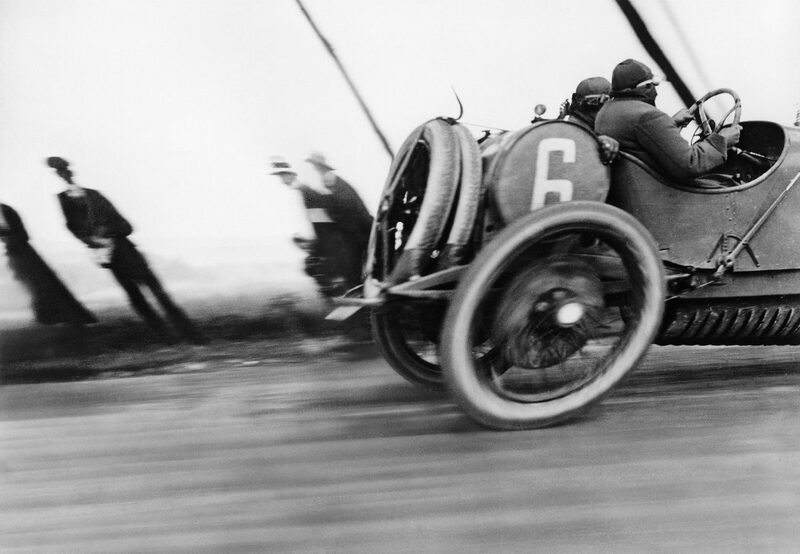 Taken in 1912, when Jacques Lartigue was only 18 years old, the photograph of a Delage automobile at the French Grand Prix, on the circult near Dieppe on June 26, 1912, was one of the first visual records of speed. While at the time, Lartigue thought the image – blurry, cropped, distorted – was weak, even a failure, it is now considered an icon of twentieth-century photography. Lartigue’s photograph of the Delage racing car at the Grand Prix is also the subject of the essay “Panégyrique de l’accident photographique” by Clément Cheroux in the exhibition catalogue, published by Barral. The proposed image also symbolizes the upcoming Nuit de la Vitesse (Night of Speed), a round-table discussion held on June 20 by mathematician Cédric Villani as part of the museum’s Soirées Nomades program.